Today's tablescape has been a long time coming, and I can't really say why. I've had some of the components in my tablescaping stash for over a year; even before I ever started my blog. I've wanted to do a beach-themed tablescape for so long. Even this one has been thought about and re-worked, started and stopped. Has this phenomenon ever happened to any other tablescapers? Finally, I got up this morning and decided, I would just put the table together and let it turn out as it would. No more debates on tablecloth or placemats, netting or no netting, yellow or white plates, shells or lighthouses for accents??? Etc., etc., etc...... So, this is the final result for my beach-themed table. I decided to forego table linens. I felt the dark wood would better ground the elements of the table. I added a straw placemat whose sand color seems appropriate for the beach, and because I like the rough texture of the mat. My plate stack starts with my white Metaceramica plates from Portugal, purchased at HomeGoods. The next plate is one I found at Tuesday Morning (on the clearance rack!). I saw the texture of it and the shell design around the border and knew I wanted it for a beachy tablescape! It is labeled Mud pie, Shell Dessert Plate. The next plate is from J. C. Penney's and I got it a while ago during a major sale event. I LOVED the color of it, its unusual shape and the crackle-effect of the glaze. It is labeled ASA Selection, Germany, and is the salad plate of the collection. The table setting was completed with turquoise-colored goblets (generously given to me by dear friends who were moving and downsizing) which I decorated with shell napkin rings I had originally bought for my beach tablescape (another change of heart!). 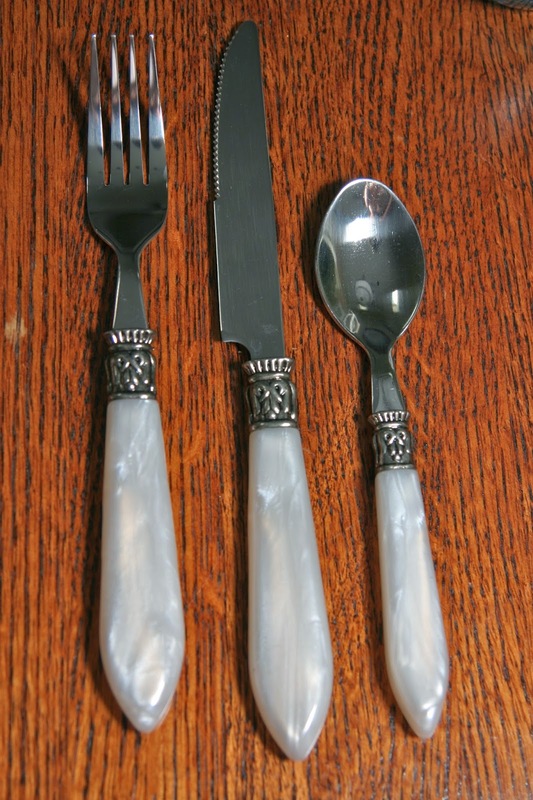 The flatware came from one of my trips to Tuesday Morning. It is labeled Cambridge Stainless Steel; pattern: Cameo Ivory. I am extremely happy with it and you'll probably see it in many of my future tablescapes!! I also added individual votive candles and candleholders that were used at my daughter's bridal shower. I'm hoping they add a warm lighting effect to the table. My centerpiece starts out on a fishnet accent I got at HomeGoods. I purchased the white lantern at least two years ago at Sears. I was actually Christmas shopping and discovered it on a clearance rack! I bought it long before I thought of blogging, and just felt I'd use it on a summer table sometime! It's filled with shells from a gift shop located on a local pier, and a pillar candle. The lantern is flanked by two glass domes I purchased at a thrift store in Ojai, CA and the faux sea urchin and starfish are from a shop in Ventura, CA where we recently vacationed. And, a conch shell my hubby got me MANY years ago from Catalina Island when I was teaching Lord of the Flies to my freshman English class and needed a teaching prop to illustrate how the stranded boys from the story signaled each other to call their "meetings" together on the island. So, I finally completed my Beach Tablescape! I had thought of using multiple colors on the table to reflect the many colors of the beach and sky; I just couldn't decide what sort of table covering I wanted to use, and I had even toyed with the idea of sand (somewhere on the table!) But, in the end, I kept the color scheme simple aqua blue and white, so reminiscent of the blue of the ocean and the clouds in the sky on a beautiful beach day! I'm officially "unstuck" once more! Enjoy your summer months! Susan at www.betweennapsontheporch.net for Tablescape Thursday. Thank you, Ladies, for hosting these parties! Please join these parties and see what others have created!! I love to hear from you and your comments are always appreciated! Oh, there are some really exceptional details here! Love the white shell plates, absolutely adore the curved turquoise plates and the pearl flat wear is perfect. Of course the shells and netting and lantern are fitting as well. Nicely done! Beachscapes are always one of my favorites. I love your choice of the napkins, they do tie the colors together. The textured shell plate topped with the aqua plate with it's wavy edge and varied colorations, screams waves crashing on the beach. Thanks for the last pic highlighting your beautiful exterior wall, it gorgeous. So beautiful. 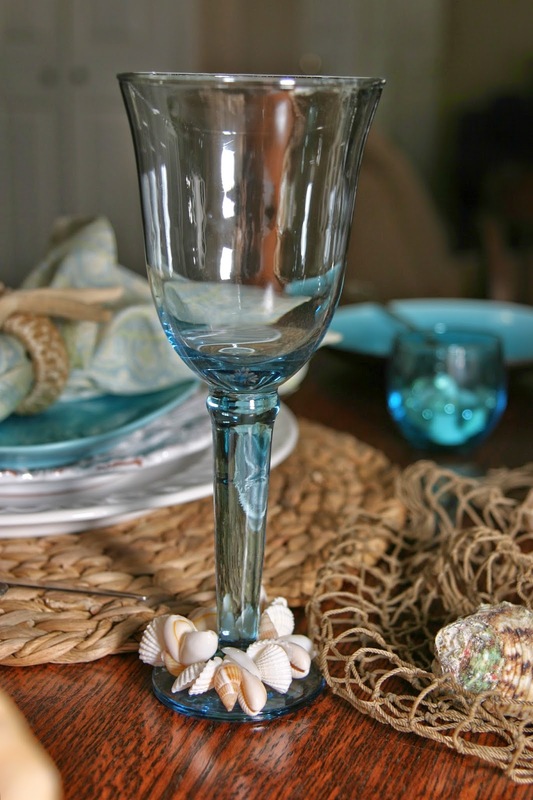 I love the sea shells around the stem of the goblets. Thanks for sharing. What a gorgeous backdrop for your beachy table for us to get a glimpse of your patio. Love your beachy tablescape. I know exactly the feeling of meaning to get a tablescape done you have been thinking about. The softness of the aqua paisley napkins bring all your colors together nicely. I like the shell rings around your glass and and the new napkin rings with a starfish. The netting and lantern add the perfect finish with shells scattered about. I heard the beach was gorgeous over the fourth. Have a great week, Emily. Still want to meet you it is just so far for me to make the blogger meetings. Love that shade of blue and the shells at the base of the stems are perfect! You set a fun table! All your beachy details are standouts. Great job! Rosie, I think you ended up with a delightful table! I really like the napkins you found; I agree, I think they work better than a plain aqua would. And I love, love that flatware. The conch shell is gorgeous. Well done! You nailed it, girl! Beautiful beach-themed table!! I have a tablecloth in the pattern of your napkins. They are so pretty, I'm going back to HG to see if they are still there. Enjoy your weekend!! Well worth the wait. Great tablescape! Hi, Rosie! Great idea to deep-six the tablecloth and just let the fine wood show! It really adds to the natural feel of the table. The shell plates were a fabulous find!!! I've heard of the Mud Pie brand, and they always have fun stuff. The napkins you decided on are perfect, too. I think having a pattern like that really makes them stand out and bring in colors from all the plates beneath. I love the creativity of the napkin ring, too! GREAT idea to add the napkin ring to the base of the goblet!!!!!! I'm so glad you were finally able to get rid of the block that kept you from finishing this table. Have a happy weekend!!! I am loving this table...the whole time I was looking at it I was thinking I really need to get some beachy accessories...and I am totally crushing over those shell plates Rosie! My mind is singing by the sea, by the beautiful sea after looking at your beautiful table. I love the plates and I love the colors. Most of my tables start with one inspiration piece and come together after months (and sometimes years) of looking and collecting all of the little things that turn a table setting into a tablescape. You did a marvelous job of defining what you wanted your table to be.